Moving Forward: What is next for Red For Ed? 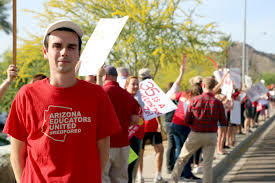 Arizona Educators United spokesman Noah Karvelis stands beside dozens of teachers and public education advocates protesting. Fresh off the week-long statewide teacher walkout, Red for Ed co-leader Noah Karvelis answered questions on what his organization accomplished and where its members will channel their energies in the coming months. Karvelis expressed happiness with the movement they were able to energize, the “empowerment” Arizona teachers harnessed in the walkout, and the down payment in increasing funds towards our state schools. This was more impressive given that the Red for Ed Movement did not negotiate directly with Governor Ducey or any of his allies. Moving forward, Karvelis (who is also the campaign manager for Superintendent of Public Instruction Candidate Kathy Hoffman), said that the goals for Red for Ed are to bring education funding to the level where it was in 2008. What passed the State Legislature last week was still $700 million short of restoring parity to our education funding needs. To that end, the movement will champion and campaign for the Invest in Ed Ballot Initiative. Saying the wealthy should pay their “fair share,” Karvelis expressed reservations about a sales tax to fully fund education, calling it “regressive.” He favors Invest in Education coupled with other measures that would bring in funds from a “devoted revenue source” such as income tax increases with a trigger to adjust funds for inflation. Mr. Karvelis and his team should be congratulated for the positive change they have helped usher in for Arizona’s public schools. Congratulations and thanks should also be extended to everyone that was willing to fight for better conditions for Arizona children’s schooling. As Karvelis and the other members of Red for Ed would point out, there is a long road moving forward. There are pro-education candidates to support in the November elections. Voters need to read where each candidate, from both parties, stand on the issues of moving children’s education forward to help make an informed decision. There are ballot initiatives to fight for and against. Finally, there are dark money and open reactionary interests to ward off. If the people make fully informed decisions and objectively evaluate where the candidates stand on the issues, the sun should rise on a bright day on Wednesday, November 7, 2018. Need to clarify…vouchers do not apply to charter schools which are technically public schools and don’t charge tuition. Hello all. What is next for Red for Ed … is to develop a comprehensive political strategy that places the burden directly on the shoulders of the people elected to fulfill the promise. Red for Ed has shown its political muscle. It can collect a highly motivated group of people, and place them on the doorstep of the capitol. That’s a good thing … it reminds lawmakers of who is the boss: the people of Arizona. For the people of Red for Ed, etc, to presume that they carry sufficient political muscle to determine the fiscal policy of Arizona, however, needs moderation. Needs reflection. Needs adjustment. The proper place for determining fiscal policy is on the shoulders of elected officials. It is the members of the house and senate who must bear responsibility to find the cash to fund Arizona’s school system. Red for Ed … can again raise the crowd as necessary to support house and senate membership efforts to find that cash. For Red for Ed to do otherwise will raise the wrong opposition and focus that opposition on the wrong group of people. Out-of-state cash will find a home here in Arizona, the governor will be helpless to support the effort, and the right wing will be vindicated. All bad, no good. Red for Ed needs the support of the governor. His voice, and his political machine, are powerful and all encompassing. With the governor’s voice, the Republican party of Arizona can be brought together. Red for Ed … take the radical, forward strategy: endorse Governor Ducey.